The move from Devon to Oxfordshire was minus lots of plastic pots and other gardening paraphernalia. All replaceable, was my thinking. Anyway, the removers strictly speaking wouldn’t take pots or other “soiled” contents as we were going in to store. At this end, I’d thought make my own pots. After seeing the price of those fancy plant pot makers, thoughts turned to papier mache or using flour and water glue. 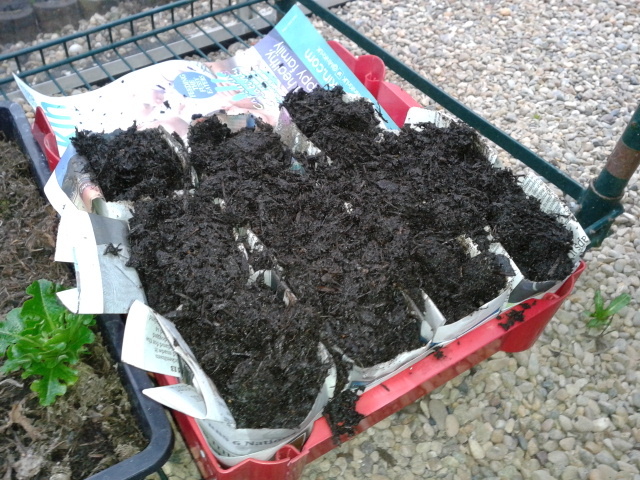 To my great surprise today, Google came up with the excellent YouTube tutorial above on turning newspaper into biodegradable pots, ideal for seedlings. This afternoon I turned out 20 or so. Unfortunately, all those Saturday papers I’d save had been binned by the other half. So, today’s travel sections was sacrificed and the sports section will follow once I’ve had a chance to read it. 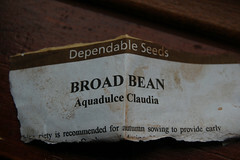 Meanwhile, I’ve sown Masterpiece Green Longpod broad beans. As this is my first year in the new allotment, I’m not sure how broad bean and other legume seeds survive if direct sown. Back in Devon, direct sown might as well have been fed direct to mice. Technically it’s still winter. Blue sky, temperature nudging the teens and hardly a breathe of wind: more like mid-spring. Great weather for both planting out and putting in a few hours of digging. In fact, right now is perfect for digging. There has been hardly any rain over the last three weeks so the ground is soft but not claggy. My replacement broad beans went in yesterday. Unfortunately, some little critter(s) had a nibble of the beans when they were hardening off in the greenhouse. With any luck they will recover and start to flourish in their nicely raked bed. Today, I finished planting a second set of brown onion sets – Sturon variety. Back in the Autumn I planted out Swift sets. Most of these have sprouted though the hard frosts, snows and other critters have taken a toll on numbers and progress. As you can see, the sets have been covered to keep the birds off. I’ll leave them a few weeks to get a start before exposing fully to the elements. The nice weather brought a few other allotment buddies. Everyone else seems to planted broad beans this weekend. Let’s see who harvests first. A short video showing the newly planted broad beans, onions and garlic. 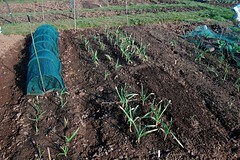 A lovely Sunday afternoon: sweating as I prepared another garlic bed and started digging a bean trench. 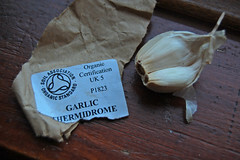 Four lovely Thermidrome bulbs arrived unexpectedly in the post this week. I couldn’t remember exactly what I had ordered. Sprint bulbs went in last week and I’d assumed that was it. More lovely garlic. I have to admit that this year’s crop of garlic has been spoilt by nearly half the crop going mouldy. It’s my own fault for lifting the bulbs too late. They “went over”, but I delayed lifting for a couple of weeks. Seems like some of the early crop – Spring, I think – developed mould. Up the other end of the plot, there’s now a nice trench that will, no doubt, fill with water this week. 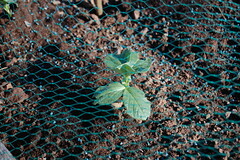 To avoid losing seeds to mice, the broad beans are getting going in the greenhouse. Most have germinated and I aim to plant out by the end of the month. Here’s hoping for a few more decent gardening weekends before the autumn storms start tracking across the south-west. 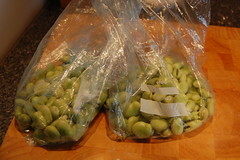 Picked a big bunch of broad beans this evening. Managed to get 1lb 4oz. The pods are just about at their peak. So, even though this lot were for the freezer, there will be plenty more to eat fresh this weekend. 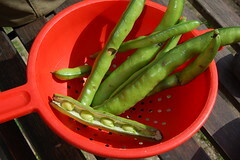 First pickings of my first broad beans: a tasty treat for Saturday. There were a few waxy looking pods of beans that had also fallen over in the wind; a bit chewed too. The pods felt as though they had decent sized beans in them. So, I tried them out on Saturday. Tasty, that’s what I’d say. A little young so I’ll wait a week or so for the next picking.